Enalapril is a prescription medication that has been found to be very effective in the treatment of dogs who suffer from serious heart problems, including high blood pressure, heart murmurs and more. It can also reduce the symptoms of congestive heart failure, as well as additional cardiac diseases. It is often used to restore blood pressure back to its normal level by easing stress on the blood vessels. Enalapril contains nutrients that help reduce heart failure and improve chances of survival after a heart attack has occurred. It is available by prescription only and has been touted as one of the best medications on the market today for pets suffering from cardiac diseases and other blood related illnesses. 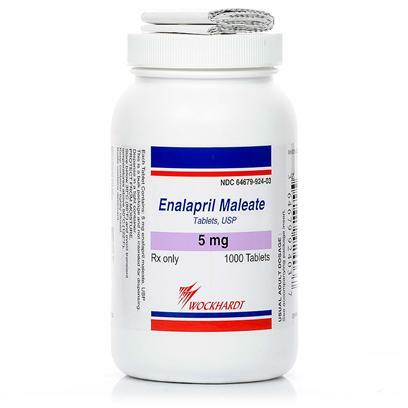 Enalapril can cause some serious side effects that should be immediately reported to a veterinarian: low blood pressure and resultant weakness, an upset stomach (loss of appetite, vomiting), and changes in urination. Less frequently, Enalapril can cause kidney failure. This most often occurs when higher doses are being administered, and when the drug is being administered to an animal suffering from kidney disease. Side effects are more likely to occur when Enalapril is being taken together with other potent drugs. Do not administer Enalapril to your pet in conjunction with furosemide, spironolactone or non-steroidal anti-inflammatory. Enalapril is administered orally once or twice daily, based on your veterinarians’ prescribed dosage. The duration of the treatment is dependent on both the condition being treated and the animal’s positive or negative response to the treatment. The treatment should be continued for the length recommended by your veterinarian, regardless of whether the pet is feeling improved or not, in order to prevent a relapse.